Smooth almond butter that tastes like carrot cake…without the additional carbs. 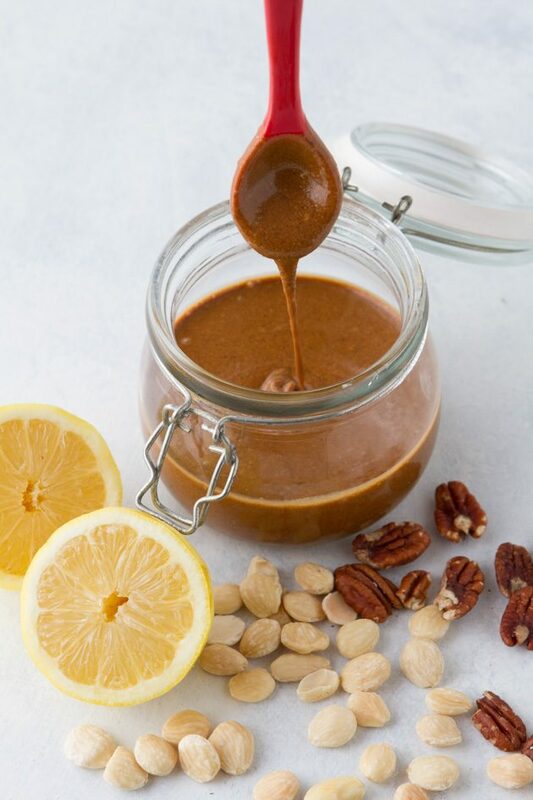 A mixture of marcona almonds, pecans, lemon, cinnamon, and butter for the perfect keto nut butter. MACROS: Fat 85% Carbs 8% Protein 7%. Preheat oven to 350°F (177°C). Place the almonds and pecans on a small baking sheet. Transfer to the preheated oven and roast for 10 to 15 minutes, rotating every 5 minutes, until nuts are lightly golden. Meanwhile, place remaining ingredients in the jug of your high-powered blender or bowl of your food processor. 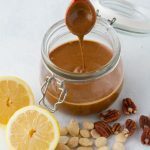 Add the roasted nuts, cover, and blend until smooth, about 2 minutes. Transfer to a 10 fl. oz (300 ml) jar or larger. Store in the pantry for up to 1 month or in the fridge for up to 3 months. Marcona almonds: can be replaced with blanched almonds. Butter-infused coconut oil: you could use any oil here, but the butter-infused is nice! If you can tolerate ghee or grass-fed butter, it would be delicious! Eggwhite protein powder: you can use any of your favorite protein powders. Just be cognizant of the flavor they may add to the final dish.